THE STORY - U.S. Navy SEAL Chris Kyle (Bradley Cooper) takes his sole mission -- protect his comrades -- to heart and becomes one of the most lethal snipers in American history. His pinpoint accuracy not only saves countless lives but also makes him a prime target of insurgents. Despite grave danger and his struggle to be a good husband and father to his family back in the States, Kyle serves four tours of duty in Iraq. However, when he finally returns home, he finds that he cannot leave the war behind. THE GOOD - Bradley Cooper and Sienna Miller's performances are absolutely outstanding. The two carry the weight of the film along with Clint Eastwood's tension, respect for the military and the editing and sound design. THE BAD - THE FAKE BABY!! The film does tend to lose sight of its pacing in a few spot specifically in the second act. It cannot focus on what it wants to discuss at certain moments turning this into more of a propaganda picture at times with its heavy handed message. ​​​Clint Eastwood’s “American Sniper” is an emotional depiction of the toll soldiers endure after being in a war zone for long periods of time. With a career-best performance from Bradley Cooper, the film is not only intense but realistic in its depiction of PTSD as well. Despite some of the slower sections of the screenplay, the film is still quite moving and even heartbreaking at times. Eastwood continues to prove that he can tackle massive scale as time goes on, crafting one of the greater war films in recent memory, despite its flaws. Adapted from the novel of the same name, "American Sniper" revolves around the tour's of Chris Kyle (Bradley Cooper) a Navy S.E.A.L. sniper. Chris is now renowned as the greater American sniper in military history. He saved countless lives with his unmatchable accuracy as a marksman and the film depicts this with palpable detail. We witness the moral decisions Chris must make when choosing to kill someone. Whether it be to save himself or the lives of those around him. His decisions are usually made with the latter in mind, choosing to eliminate specific targets so that his group of soldiers is not harmed in any way. The film depicts real-life events that happened to Chris and just about all of them are tragic as we see this tough and proud American succumb more and more to his crushing devotion to his country. We get to witness Chris' decision through the lens, or scope, of anguish. A constant bearer of hatred and evil, Chris is aware that whatever is on the other end of his scope must be eliminated but there is also an emotional weight attached to each casualty. 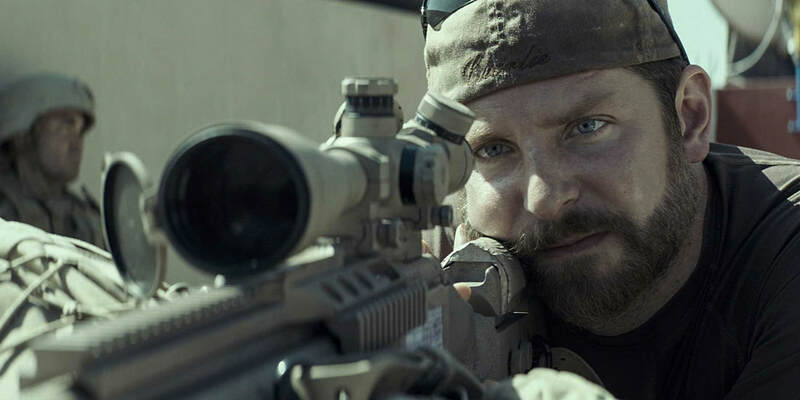 Other than Bradley Cooper's performance, "American Sniper's" is at its most magnificent in its depiction of moral contemplation. The choice of whether or not to kill a child or just another human being in general. The film weaves its way in and out of war scenes and small emotional scenes back in the U.S as we see the cost of war to Chris' private life. Not only does Clint Eastwood (Well into his 80's at this point in his career) perfectly coordinate the war sequences that are layered with countless action beats and many moving parts but he also handles the much more subtle moments with absolute grace, treating Chris Kyle, and the two families he fought for (His country/the military and his family) with the utmost respect that they deserve. The action set pieces are well choreographed but the film is greatly heightened by its performances from Bradley Cooper and Sienna Miller. Cooper is at his absolute best here, channeling something that we have never seen before in his career. He gives these subtle facial expressions that can change within seconds due to his unstable state of mind. The flashback scenes help us to see the contrast and evolution of his performance. Utilizing this ability to his advantage, Cooper creates a performance that seems absolutely unheard of. Although many complained that he stole a Best Actor nomination at the last second from possibly more worthy performances in 2014, I would wholeheartedly disagree. Sienna Miller also carries a great amount of weight within the film as well, as the constant within Chris' personal life, away from the war. Creating an entire environment and landscape through her performance, she is the rock to Chris and is everything that he is constantly longing for. Yet he is always worried that he will let her down or disappoint her in some way shape or form. She works on the same plane as Cooper, yet she counterbalances him well throughout, acting as the force that is trying to pull him back down to reality. "American Sniper" is another great film from the cinematic legend that is Clint Eastwood. He manages to not only to handle the scale of the war sequences with great care but also the moving and more disturbing scenes of Chris' home-life as well. Paying his due respect to the Kyle family, Eastwood creates an emotional heartthrob of a film that made millions of American audiences proud to be an American. Maybe it was a bit too preachy and almost teetered into propaganda. Yes, there is a scene involving a clearly fake baby that is all way too distracting. And yes, the film is not subtle in its message. What is subtle and still retains its power, however, are the career-best performances from Bradley Cooper and Sienna Miller. Along with Clint Eastwood's sure directorial hand, they made "American Sniper" a film that will not be forgotten about anytime soon.